Skydiving is the purest form of adrenaline you can experience. It involves jumping out of a perfectly good plane and free falling for about 60 seconds. This is when you open your parachute and (hopefully) float down safe and sound. Over the past few decades, skydiving has turned into a recreational activity for millions around the world- and a competitive sport as well. Before anything, a skydiver has to suit up. Wearing the proper gear will keep you safe and help make the experience more fun. Falling towards Earth at 60+ mph doesn‘t feel good- which is why they created jump suits. A jump suit is a special type of material which prevents air from getting inside your clothes. It also helps keep them on too! From there, the skydiver puts on air resistant goggles. This also keeps air out and helps you see. Finally, a parachute is strapped to your back. This is what keeps the skydiver from spiraling down to the ground. It consists of a special mesh that opens up and helps the skydiver float down. It opens up two ways: by pulling a string on the pack or it letting it open up automatically when you reach a certain altitude. Skydivers who jump together take turns making sure they are equipped properly. Once everything is cleared, they all board a plane (sometimes 20+ people). It quickly gains altitude and usually flies steady around 13,000 feet. This is the average height most jumpers deploy from and allows about 60 seconds of free fall. Some divers even go up to 16,000 feet which allows for 75 seconds of free fall- although it is harder to breathe from that height. When the plane flies over the landing zone, the skydivers begin jumping out of the plane in order. Then you coast downward until about 2,500 feet then open their parachute. From there, it is a slow and smooth landing onto the ground- and a memory that you will never forget! Certified skydivers have recorded thousands of jumps throughout their career. This is required if you want to be an instructor and jump with other people. Obviously, if you have never skydived, you won’t be able to jump alone- you have to do it with somebody else. This is called Tandem Skydiving. This is the most popular method for training first timers. Although it is more expensive than solo diving, it is required if you ever want to jump alone. When you participate in tandem skydiving, the amount of work for the student is minimal. The whole idea is to learn about equipment set-up, jumping basics, etc. The instructor is the one in charge of performing the jump safely and correctly. After jumping several hundred times, it is going to get old. Jumping normally won’t be fun anymore- you are going to want something different. This is the point when most veterans take on sky surfing. 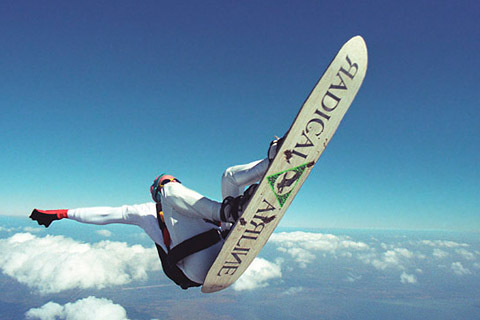 Sky surfing is a form of skydiving when a diver attaches a board to his or her feet before jumping. This allows them to perform cool tricks during free fall. The board itself is smaller than a surfboard. It looks more like a snowboard than anything else. There is a safety feature on the board which allows for easy removal incase the skydiver has trouble maneuvering and/or difficult operating the parachute. Sky surfing requires a certain amount of skill and takes a lot of practice. The easiest technique for most first timers is standing straight up. From there, tilting the nose downward makes you go forwards and tilting it upward makes you go backwards. Practicing this trick requires a lot of balance and concentration. If you lose balance it could cause you to flip over. The more advanced techniques include loops, helicopter spins, or rolls. However, don’t even think about trying these until you master the basics. This place is known as the skydiving capital of the world- and for good reason. The aerial view of New Zealand is captivating and gives you some of the best views on the planet. How can you top free falling over an island? That would be tough. Or even better: how can you top free falling over crystal clear water, lush forests, and active volcanoes located all over the island? Skydiving in Hawaii doesn’t get much better than this. 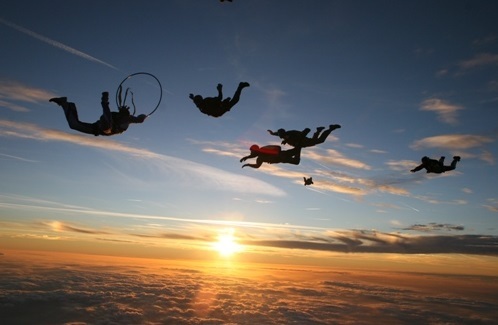 Besides the Outback and beautiful beaches, Australia offers a great skydiving experience. The view is surreal and allows you to get a taste of the true Aussie experience. 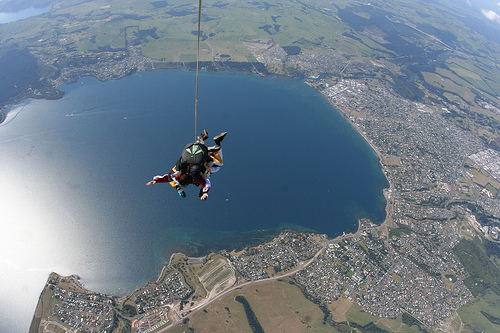 Combined with its cousin, New Zealand, this part of the world was made for free falling. This is another beautiful place to skydive. Unlike modern society, Africa has not been overpopulated by buildings and other structures. This provides the ultimate “natural” experience when falling towards the ground. Just be sure to avoid landing in the ocean- it is crawling with Great White Sharks! 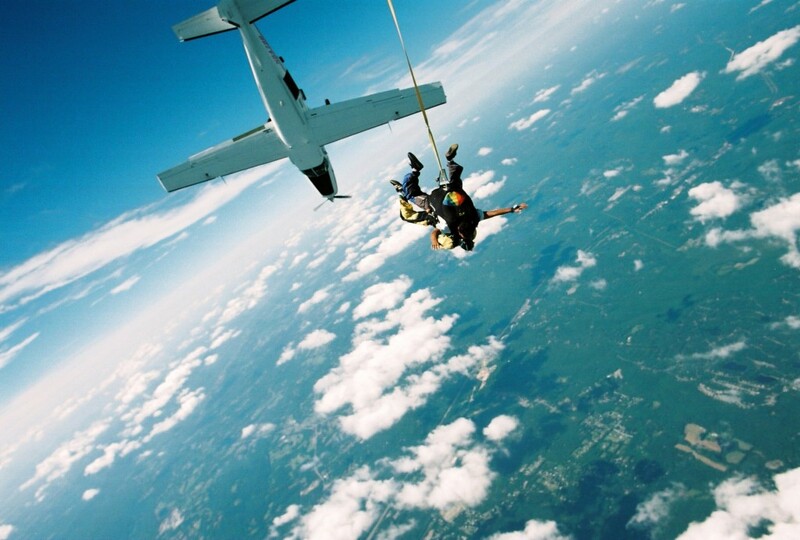 You’ve probably been wondering…why jump out of a perfectly good plane? Why bank your life on even the slightest chance that something could go wrong? Most people have their own reasons. Some do it because they are addicted to adrenaline and love the feelings it produces. Other people do it to celebrate certain events- birthdays, weddings, and/or bachelor parties. Finally, some do it to prove to themselves that they CAN do it and that they won’t allow their fear of heights to stop them from doing something. Above everything, you have to be a little crazy to try this extreme sport. Think about it: you are risking your life with a piece of equipment that can easily fail. Skydivers are a rare breed that will continue to push the limits of what is possible in the world of adrenaline. This entry was posted in Air Sports, Sky Diving and tagged Sky Diving. Bookmark the permalink.